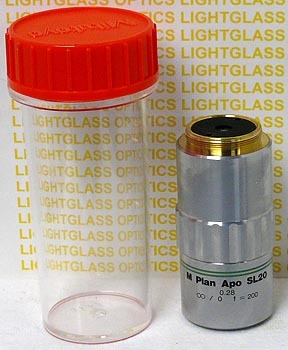 This Mitutoyo M Plan APO SL20X Objective has a 0.28 Numerical Aperture, and a working distance of 30.5mm. The Mitutoyo M Plans have an extremely flat field of view, and color rendition is excellent as well due to the well designed apochromatic optics. This is Mitutoyo part number 378-810-2.